Nick Bradbury passed 20,000 runs for CAMRA Cricket Club during an innings of 104 not out in a 141-run friendly win over Ropsley. Dan Young struck 73 of CAMRA’s 272-5. Freddie Khan made 110 not out for Huntingdon seconds in a 55-run defeat at the hands of Hampton seconds in Hunts Division Four at the age of 59! Jawad Ali had earlier struck 101 for Hampton. Muhammad Zafar made 62 of the city side’s 276-7 in 45 overs. Castor skipper Reece Smith returned career-best bowling figures of 6-34 in a handsome 105-run Rutland Division Two win over Ufford Park. Joe Higgins top scored in Castor’s 172-6 with 63. 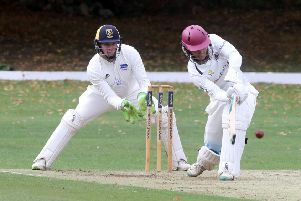 King’s Keys are poised to claim the Division Two title after hammering Burghley Park by eight wickets, while leaders March were losing at Uppingham. Burghley, who are not safe from relegation, collapsed from 51-1 to 92 all out as Tanvir Hussain (6-17) and Tahir Ali (3-2) wreaked havoc. Bretton’s perfect record in Hunts Division Four stretched to 13 matches with a hard-fought eight-run win over Castor seconds. Gulraiz Khan (69no) and Neil Buckingham (64) scored best in Bretton’s 199-6.